Boxes in My Alleys is Dancing on the Edge’s newest international exchange project. It is a community art project taking place in the town of Akko (Israel/Palestine), bringing together a group of local and international artists from diverse backgrounds and disciplines (theater makers, film makers, and others), that will create work in collaboration with local residents. The first result of this project will be an open air performance in Akko. Local Palestinian artists have already started their research and artistic process, collecting stories, memories, fantasies and dreams of the local residents – from the youngest generation to the golden age generation. The people of Akko will be encouraged to tell their stories using puppets and theater props. Their stories will be recorded and reviewed together, so that everyone working on this project is included both in the artistic process and the result. In March 2018, Thabi Mooi (NL) joins the local team to work with the other artists and residents. She will give workshops and collaborate on the presentation of the project. Since her graduation in 2012, Mooi has specialized in site-specific performances in which audiences are given a special, (inter)active role. Akko is an ancient city, a historical place that combines the Crusader Period with the Ottoman Arab culture. 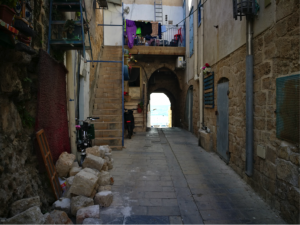 The old city of Akko has a lack of resources and suffers from poverty and a high rate of unemployment. In the alleys of this old city center the creative process takes place. The performance takes place at 17:00 on the 26th of March 2018 at Weizman Street 5 in the old city of Akko and will be the pilot for this project to further develop into different neighbourhoods or cities. Boxes in My Alleys is a collaboration between QumraHouse and Dancing on the Edge, and is funded by the Dutch Embassy.